Gujiya is a traditional sweet from Gujarat & Rajasthan and uses a century old recipe. 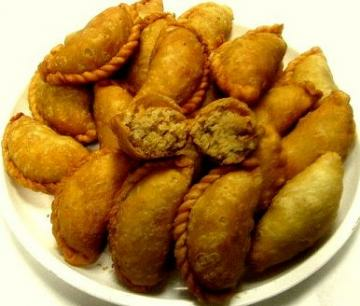 If you have had Gujiya before, we are sure you love it. It is a in the shape of half moon, soft, crunchy, flaky and delicious. Feel the unique flavor and delicious taste in every bite. Traditionally It is a must in some of the North Indian festival. Major Ingredients: Flour, Mawa (KHOYA), corn oil, suji, coconut powder, sugar, illaychi, raisins, Almonds, Pista, Kharbuja Seeds. Refrigerate upon receiving and serve at room temp. for best taste. Buy Gujiya (Guguru), 1 Pound, sold & shipped by Bengali Sweet House where you can shop online for Quality Indian Sweets, Snacks & Gift Baskets Shop - Bengali Sweet House. This Gujarati Snack collection has been tagged as Indian Sweets, South Indian Chandrakala Gift Box, Fresh Indian Mithai. I would like to purchase Gujiya (Guguru), but how many pieces are in 1 pound? It has around 7 to 8 pcs in 1 lb.